This 60-minute video is the definitive power tool for learning to unlock the muscle of today's shaped skis. It is an extraordinary visual study of the consummate skiers on the subject featuring exclusive footage of Olympic gold medallist, Tommy Moe, extreme skier Jeremy Nobis, and PSIA National Demonstration Team members Jay Evans, and Ellen Post Foster. TPSF produces winter snow sports books and videos relating to ski education. They are published and authored by, and feature Ellen Post Foster and Alan Schoenberger. Foster is a former eight-year member of the National PSIA Demonstration Team and former head ski coach of the Winter Park Ski Team. Alan Schoenberger is a performance artist and former world skiing champion. Foster is the recipient of the Russell Wilder Memorial Award from the U. S. Ski Team. This site includes descriptions of its published works including reviews from national demo team members, the US Ski Team and PSIA national and regional divisions. You can also purchase them online from this site. These ski education pieces feature significant ski talent. In addition to Foster and Schoenberger, World Cup U.S. Ski Team members include Olympic downhill gold medallist Tommy Moe, Tait Wardlaw and freeskier Jeremy Nobis; twelve-year PSIA National Demonstration Team member Jay Evans; and free skier and mogul specialist Justin Patnode of Warren Miller fame. These ski books and videos are used extensively by the Professional Ski Instructors of America, PSIA ski teachers and ski schools, US Ski Team coaches, the United States Ski and Snowboard Association, USSA and the United States Ski Coaches Association, USSCA coaches. 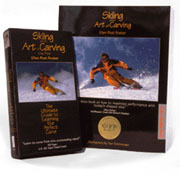 The book and video Skiing and the Art of Carving have been presented to Interski by PSIA. They help develop pure carve, fun carve, funcarve techniques on shaped, deep sidecut, parabolic skis; freestyle mogul technique; and freeski and powder techniques. Many skill development exercises, ski tips and lesson plans are included. They are very helpful in developing ski racing techniques for slalom, GS, Super G and downhill disciplines. They feature information for beginner, intermediate and advanced skiers wishing to improve skiing skills. Directed Free Ski and Mountain Playground theories are also covered. Our books and videos on skiing have been photographed and filmed in the Rocky Mountains; in Vail, and Arapahoe Basin, Colorado; and Alta, and Snowbird, Utah, The on-snow images for the books were created with 35mm and medium format cameras, and the videos are all created with 16mm film cameras. Photography and cinematography is by Alan Schoenberger. Alan Schoenberger creates, produces and performs a one-man theatrical touring productions on skis, Schönberger Skis the Stage in which he physically skis the stage. Schoenberger, who has been touring his theatrical skiing specialties for over two decades, has performed live with the Rochester Philharmonic Orchestra, and opened the 1994 World Cup in Vail, Colorado as the master of ceremonies (on skis). Schoenberger performed a compelation of works at the 2002 Winter Olympics in Park City, Utah, Schönberger Skis the Stage to wonderful accolades. The Turning Point Ski Foundation is located in Park City, Utah. These ski education projects have been made possible by generous grants and sponsorships from PSIA Northwest, Dynastar, Boeri, Lange boots, Marker, Kerma, Motorola, Bolle, Reusch, Phenix , Spyder and Packasport. Funpark, ski instruction, twinboard, terrain park, ride, karving, halfpipe, deer valley wedding, chris whitley. Copyright © 2006 Turning Point Ski Foundation, Inc. All rights reserved.